Illustration Demo with Blick on Saturday! Calling all fellow artists! (and aspiring ones!) Have you ever wanted to try working with Copic markers? Or learn different marker rendering techniques? Or maybe you just want to have fun creating something pretty?! Join me on Saturday, November 17th from 2pm-4pm at the new Blick store in Flatbush Brooklyn for their Grand Opening celebration as I host my very first drawing demo! This entry was posted in NYC and tagged art demo, art store, artist, blick art materials, blick broolyn, blick flatbush, copic marker, drawing demo, fashion illusrator, fashion illustration, fashion sketch, fashion sketches, glitter shoe, gold, high heels, illustration, illustrator, joanna baker, marker rendering, shoe drawing, shoe sketch, shoes, sketch on November 13, 2018 by Joanna Baker. New Shoppable Art Supply List! 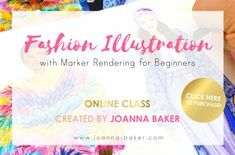 This entry was posted in Inside the Studio and tagged art supplies, art tools, artist, behind the scenes, copic marker, fashion illustration, fashion illustrator, illustration, illustrator, joanna baker, prismacolor pencils, supplies on June 11, 2018 by Joanna Baker. This entry was posted in Illustration Inspiration and tagged art challenge, artist, copic, copic art, copic marker, fashion, fashion illustration, fashion illustrator, gown, ice princess, illustration, illustration inspiration, illustrator, january, joanna baker, sparkle on January 29, 2018 by Joanna Baker.